Yours truly has been ever-so-slowly getting through the newest Tolkien book The Fall of Arthur for the last month-and-a-half with a hope of at some point stringing together a few poor words on the subject. I’ve also been reading other what others have had to say in the media. This piece, by Tolkien scholar John Garth, is a good place to start if you’re interested. shadow-helmed to war, shapes disastrous. But this isn’t Middle-earth: it is Europe on the brink of the Dark Ages, and the army is led by Arthur and Gawain. Mirkwood is simply the old name for Germany’s eastern forests, which Tolkien borrowed for the children’s story he was writing in the same period in the early 1930s, The Hobbit. Tolkien was a writer of endless stories. And as with most of them, The Fall of Arthur is literally endless: unfinished. It’s been lying among his vast legacy of papers, almost unknown but for a paragraph in Humphrey Carpenter’s 1976 biography and a single reference in Tolkien’s published letters. 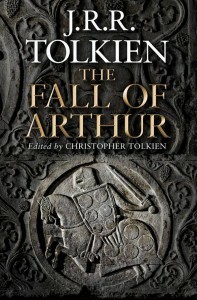 Publication follows that of the more difficult The Legend of Sigurd and Gudrún in 2009, which Christopher Tolkien probably elected to publish first because it was complete. Like Sigurd and Gudrún, The Fall of Arthur is in alliterative verse, a mode last fashionable in the 14th century.